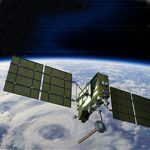 The U.S. Air Force has teamed up with the National Reconnaissance Office to build a new satellite designed to provide space situational awareness capability, Breaking Defense reported Tuesday. Gen. Jay Raymond, head of the Air Force Space Command and Joint Force Space Component commander at the Strategic Command, announced the partnership at the Space Symposium Tuesday. The partnership came after the Air Force decided to call off further updates to the Joint Mission System initiative. The report said the proposed Enterprise Space Battle Management Command & Control system is designed to support the intelligence community and collect data from a wide range of sensors. Lt. Col. Christina Hoggatt, a spokeswoman for the service, told the publication ESBMC2 will serve as the command-and-control platform “for the larger space enterprise” designed to facilitate communications and data-sharing operations. The Air Force posted a request for information in January 2017 and noted that the ESBMC2 program aims to help the Joint Functional Component Command for Space plan, coordinate and implement space operations against potential adversaries. The service’s five requirements for the ESBMC2 system are threat identification and warning; spectrum common operating picture; battle management C2; modeling and simulation for course of action development; and dynamic tasking, according to the FedBizOpps notice.